In past years, we’ve put up quarts of jam and gallons of pickles and applesauce during the summer and fall to send to family and friends for holiday treats. For some reason this year, we did none of that. Absolutely none. Our larder isn’t empty because we have leftovers from last year, but it does seem a bit less festive without all those wrapped jars taking over the kitchen this time of year. 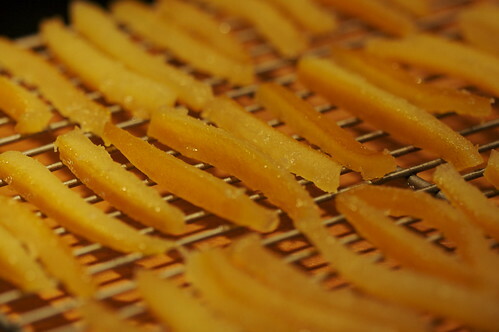 Lest you are worried, though, we of course made our traditional candied orange peels. 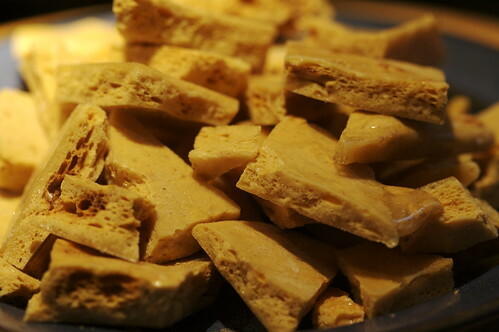 This year, because we still have a broken oven and can’t bake cookies or french pastries that shall not be named in this post, I attempted a second candy: sponge toffee. This is thanks to my sister who really knows how to make candy. Me, I’m afraid of boiling sugar, but she’s a brave soul and has ventured further into scalding sugar territory than I ever care to go. Every so often, she gives me a simple recipe, but even just reading the recipes is scary (“What’s an aliquot?” I ask my sister). Ok, but Mr. 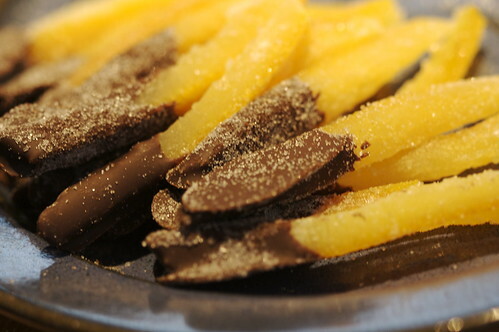 Broken Oven pushed me to the edge and I made an attempt at candy and the cool thing is that it was easy, easy enough that I could make several batches in one evening and most of them resembled the candy they are supposed to be. 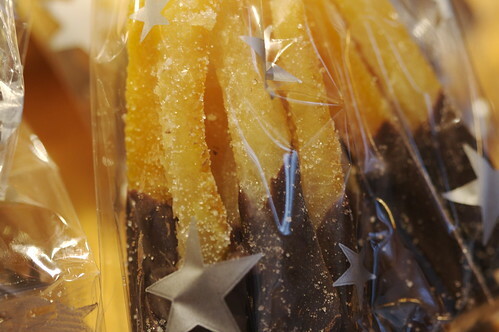 Sponge toffee is a simple but interesting candy. 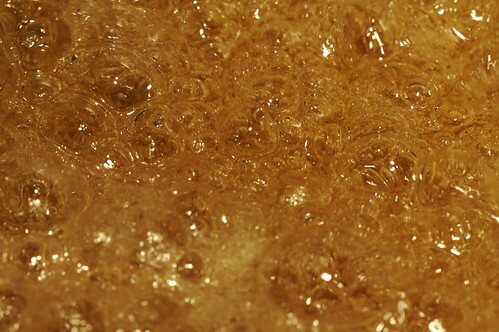 There’s not much to it (sugar, corn syrup, water, and baking soda), and, while it’s sweet, it has a distinctive burnt, almost-but-not-quite bitter, edge to it. 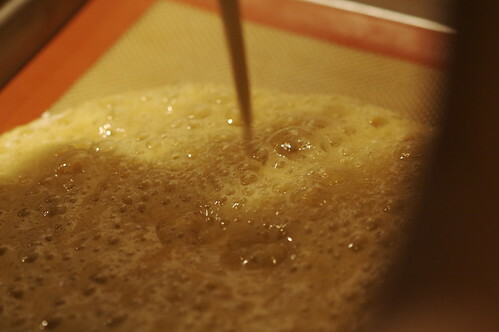 The first night I made the toffee, Hyla came by and asked for a taste. This took us a bit by surprise because Hyla usually isn’t keen to try any new food, but she does seem to make an exception for new foods in the candy category. She loved it. Sweeeeet! Mmmm. I work with a woman who recently paid $5 for a SMALL bag of sponge toffee, because she hadn’t seen it since she was a child. Thinking to be helpful, I made up a batch, and brought it in for her along with the recipe. I think I only made her feel cheated, though, seeing how easy it is and how few ingredients go into it. My sister (the expert) makes marshmallows, too, and is always surprised by how much money they sell “gourmet” marshmallows for in stores when they’re so darn easy to make. I guess the key is not letting everyone else know how easy it is!